THIS is what I want to do some day. 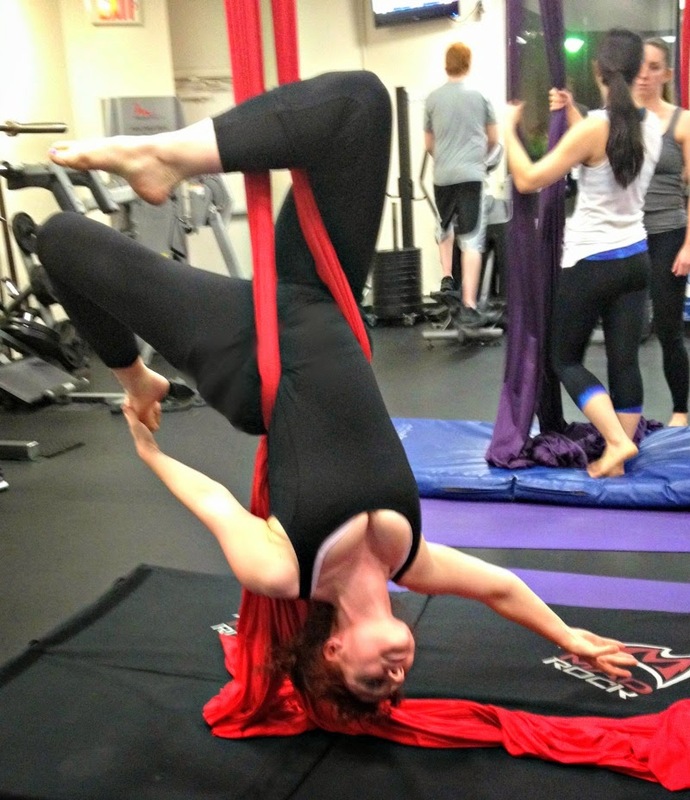 I finally finally finally....took an Aerial Dance Silks class. I have been talking about taking this kind of class since I saw Pink do her aerial performance at the Grammy's a few years ago and I felt so inspired by it. But, as you can imagine there are not that many opportunities for Aerial Dance in Pleasant Valley, NY. So I headed down to the city a few Wednesdays ago and took a class from the amazing and patient Heather of Heliummm. We started out the class by warming up and stretching our bodies,and that included our arms, wrists etc. 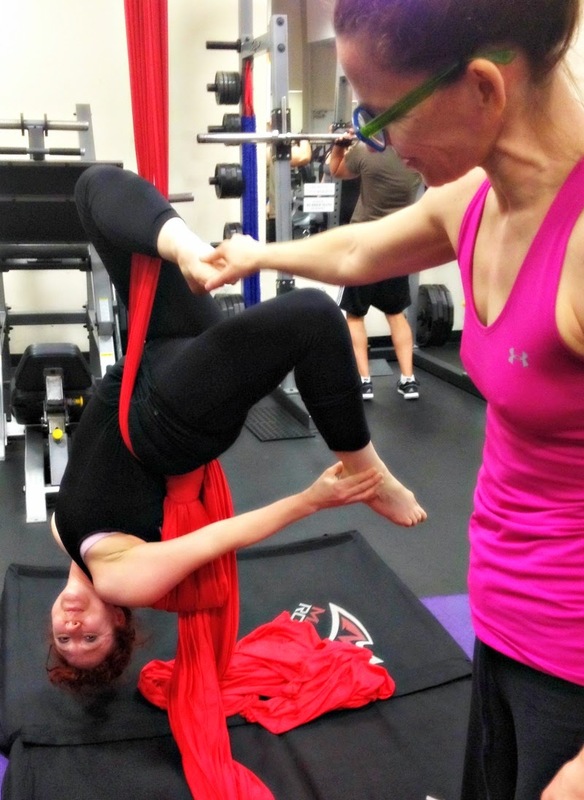 As you can imagine the Aerial Silks class uses muscles that I do not often use for regular running or workouts. Then, we learned the basics. We started with how to pull ourselves up on the silks using our arms, abdominal muscles, and feet crossed to prevent slipping. This took some practice, and as soon as I just felt it in my body and stopped thinking too hard, it made sense. After a few tries I could get up to the top of the silks, and just once let myself feel how it felt to hold on with one hand as I slid down. It was really fun. So..... I have to tell you that when you are watching aerialists perform, they make it look so seamless and easy that it makes you want to learn how to do it yourself. It is so graceful and acrobatic and sensual. I love it. But, it is harder than it looks and it took a lot of strength just to do the most basic steps. I am glad I have been working on my arms and doing so much Pilates. It definitely helped me in this case. 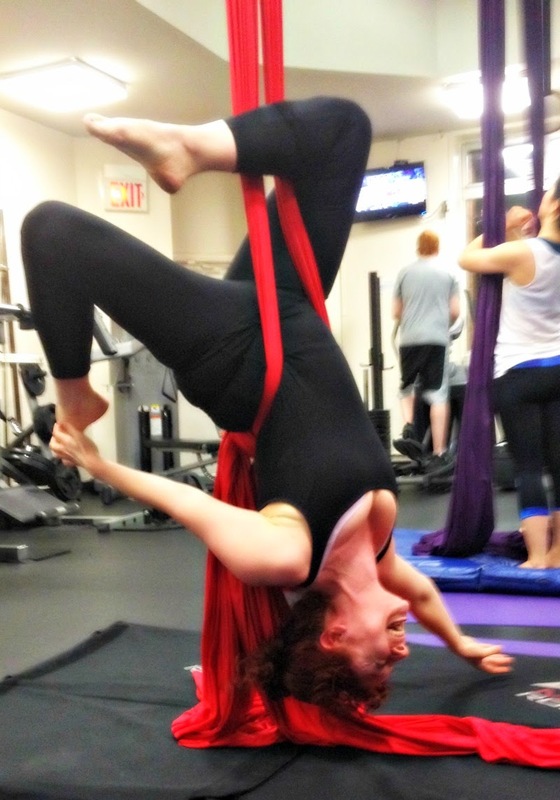 Before long, we were learning how to back flip ourselves onto the silks and dangle upside down, then switched our legs. This took a little bit of grace and a lot of patience and Heather was wonderful as she patiently worked with each one of us on how to switch and where to put our arms. The photos below were taken with my i-phone as I learned how. They may not be the most practiced or graceful of positions, but I am proud that I learned how to do even the basics. And I know that I will be taking more aerial classes in the future. I loved it. It was sensual, strong and athletic and took patience, strength and agility. 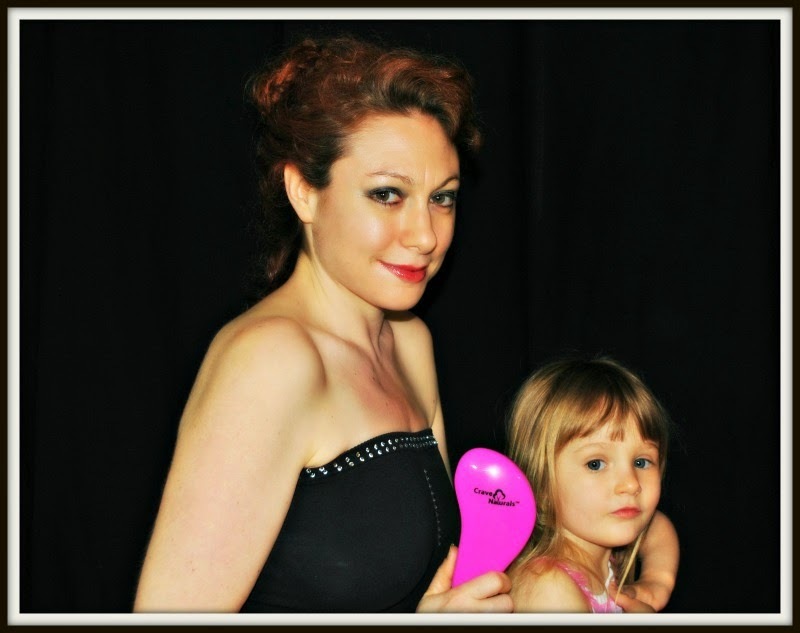 If you get a chance to take a class at Heliummm do so, before you turn 40!! That honestly looks like a lot of fun! And a more effective way to strengthen tummy muscles in way that can't be accomplished by say, tucking your feet under the couch and doing sit-ups. 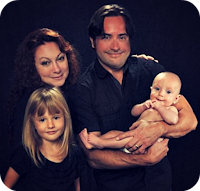 Sponsored: Review of Majestical Jewelry set!